Master of Mayhem: Ray Austin. Dave Rogers. Ten pages. 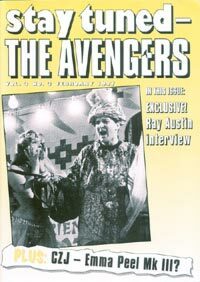 Long interview with Avengers Stuntman and New Avengers director Ray Austin. Tidbits. Dave Rogers. Three pages. Various bits and bobs from the media. Finders Files. Various authors. Four pages. Reprints of vintage Avengers press material. Catherine The Great. Graham Williams. Two pages. Ruminations on the upcoming Avengers movie.